The Battle of Lepanto was a key naval engagement during the Ottoman-Habsburg Wars. The Holy League defeated the Ottomans at Lepanto on October 7, 1571. Following the death of Suleiman the Magnificent and ascent of Sultan Selim II to Ottoman throne in 1566, plans commenced for the eventual capture of Cyprus. Held by the Venetians since 1489, the island had largely become encircled by Ottoman possessions on the mainland and offered safe harbor for corsairs that routinely attacked Ottoman shipping. With the end of a protracted conflict with Hungary in 1568, Selim moved forward with his designs on the island. Landing an invasion force in 1570, the Ottomans captured Nicosia after a bloody seven-week siege and won several victories before arriving at the last Venetian stronghold of Famagusta. Unable to penetrate the city's defenses, they laid siege in September 1570. In an effort to bolster support for the Venetian fight against the Ottomans, Pope Pius V worked tirelessly to construct an alliance from the Christian states in the Mediterranean. In 1571, the Christian powers in the Mediterranean assembled a large fleet to confront the growing menace of the Ottoman Empire. Assembling at Messina, Sicily in July and August, the Christian force was led by Don John of Austria and contained vessels from Venice, Spain, the Papal States, Genoa, Savoy, and Malta. Sailing under the banner of the Holy League, Don John's fleet consisted of 206 galleys and 6 gallasses (large galleys that mounted artillery). Rowing east, the fleet paused at Viscardo in Cephalonia where it learned of the fall of Famagusta and the torture and killing of the Venetian commanders there. Enduring poor weather Don John pressed on to Sami and arrived on October 6. Returning to sea the next day, the Holy League fleet entered the Gulf of Patras and soon encountered Ali Pasha's Ottoman fleet. Commanding 230 galleys and 56 galliots (small galleys), Ali Pasha had departed his base at Lepanto and was moving west to intercept the Holy League's fleet. As the fleets sighted each other, they formed for battle. For the Holy League, Don John, aboard the galley Real, divided his force into four divisions, with the Venetians under Agostino Barbarigo on the left, himself in the center, the Genoese under Giovanni Andrea Doria on the right, and a reserve led by Álvaro de Bazán, Marquis de Santa Cruz in the rear. In addition, he pushed gallasses out in front of his left and center divisions where they could bombard the Ottoman fleet. Flying his flag from Sultana, Ali Pasha led the Ottoman center, with Chulouk Bey on the right and Uluj Ali on the left. As the battle opened, the Holy League's gallasses sank two galleys and disrupted the Ottoman formations with their fire. As the fleets neared, Doria saw that Uluj Ali's line extended beyond his own. Shifting south to avoid being flanked, Doria opened a gap between his division and Don John's. Seeing the hole, Uluj Ali turned north and attacked into the gap. Doria responded to this and soon his ships were dueling with Uluj Ali's. To the north, Chulouk Bey succeeded in turning the Holy League's left flank, but determined resistance from the Venetians, and the timely arrival of a gallass, beat off the attack. Shortly after the battle began, the two flagships found each other and a desperate struggle began between Real and Sultana. Locked together, Spanish troops were twice repulsed when they tried to board the Ottoman galley and reinforcements from other vessels were needed to turn the tide. On the third attempt, with aid from Álvaro de Bazán's galley, Don John's men were able to take Sultana killing Ali Pasha in the process. Against the wishes of Don John, Ali Pasha was beheaded and his head displayed on a pike. The sight of their commander's head had a severe impact on Ottoman morale and they began withdrawing around 4 PM. Uluj Ali, who had success against Doria and captured the Maltese flagship Capitana, retreated with sixteen galleys and twenty-four galliots. 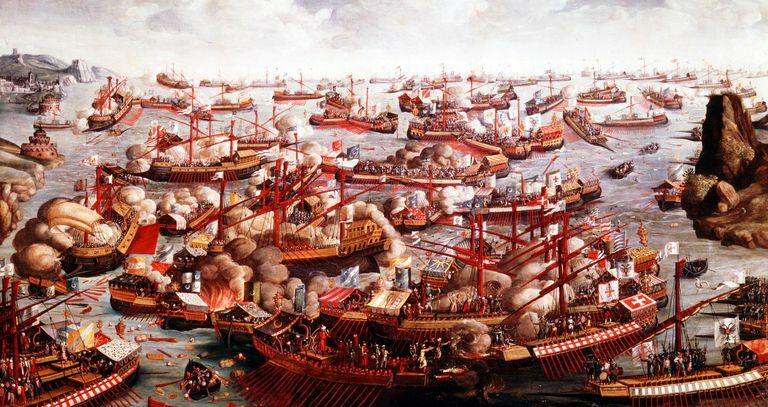 At the Battle of Lepanto, the Holy League lost 50 galleys and suffered approximately 13,000 casualties. This was offset by the freeing of a similar number of Christian slaves from the Ottoman ships. In addition to the death of Ali Pasha, the Ottomans lost 25,000 killed and wounded and an additional 3,500 captured. Their fleet lost 210 ships, of which 130 were captured by the Holy League. Coming at what was seen as a crisis point for Christianity, the victory at Lepanto stemmed Ottoman expansion in the Mediterranean and prevented their influence from spreading west. Though the Holy League fleet was unable to exploit their victory due to the onset of winter weather, operations over the next two years effectively confirmed a division of the Mediterranean between the Christian states in the west and the Ottomans in the east.